Home » art , art-I-made , blogging , humour , Kadzilla » Honored… By Mistake??? So anyways, I guess I have some inbuilt warning system. The kind of over-aggressive marketing strategy they used in their Fan Page reminded me of all those innumerable scam pages claiming to give away FREE FarmVille stuff! Moreover, they were asking all the bloggers to submit their blog links, so they could select “a few lucky ones” for an interview on their site, which did not even exist till then!!! And the amazing thing was that people actually signed up for this! I mean, are we all so desperate for fame that we’d even love to be interviewed by a non-entity? WeBlog had no existence at that time other than their newly created Fan Page on Facebook! And yet people were eager to be interviewed by them! So anyways, they got a lot of following because of the interview stint, and eventually went online with a handful of interviews to display on their .co.cc blog! And in exchange, they had over 700 naïve bloggers linking back to their site through their forced “registration” process! 700 bloggers linking to a site that offered nothing useful to them in return! Well, just for information, that kind of blog-rolling doesn’t really add any value to your Page Rank. On the contrary, that kind of irrelevant linking can actually create a negative impact on your PR. 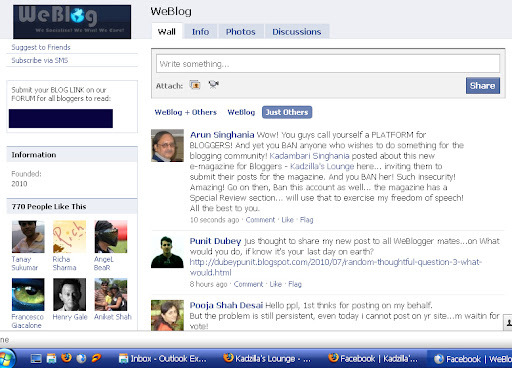 They are not maintaining a proper blog directory on WeBlog, the way IndiBlogger, Blogadda, BlogRama etc. do. It’s just a list of several hundred links in their sidebar, unrelated to each other in any context. That kind of link resource actually comes under “Link Farming”, or in simpler terms, “Link Stuffing”, and Google strictly hates it! In fact, most search engine algorithms will penalize you for linking to such a “link farm”! But, if you are like me, who doesn’t really care much about PR, but would just like to have more readers visit your site, then also, such a “link farm” is of no use to you. Tell me honestly, would *you* scroll through a list of several hundred links that aren’t sorted in any order or category, to find a blog that you might like to visit? Not really. So how do you except any of the other visitors on that apparent “link farm” to find your link from the hay stack and visit your blog? Kind of illogical, isn’t it? Anyways, right after the interview, they came up with a Sleepy Sunday Contest. I thought maybe they might have something up their sleeve after all. Even though their start was pretty shabby! So I left a comment on their contest announcement post, asking about the prize. IndiBlogger, BlogAdda etc. always declare the prizes at the time of *announcing* their contests. Well, I never got a reply to my comment. Ahh but the main thing -- coming to their slogan now: “We Socialize! We Win! We Care!” That’s what their logo says. And they have kept up this charade of creating a “useful community for bloggers” since their inception. But there is so much discrepancy in their words and actions! When I was about to start Kadzilla's Lounge, I had left a message in various blog forums, asking bloggers of specific categories to write to me if they’d like to contribute. Clearly, such an interaction is solely for the benefit of the blogger community. And any entity proclaiming to “Care” for bloggers would recognize its benefits for the bloggers, and encourage it with full support. But WeBlog actually banned me from their page instead! Just for posting a notice, that a certain category of bloggers could showcase their work on a new ezine if they wanted to! 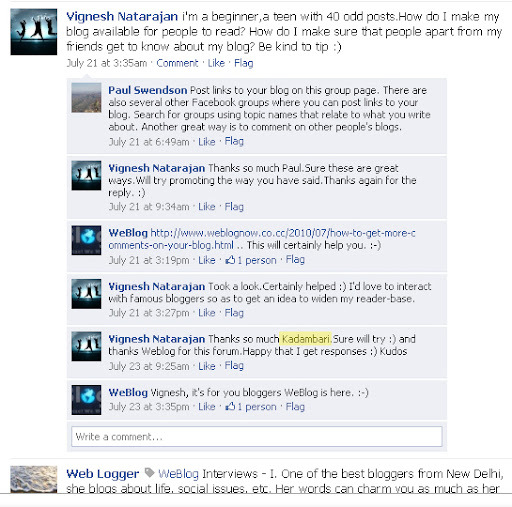 Here, take a look at this screenshot… Vignesh asks for some advice, and, like Paul, I also gave him some general tips. You can see his “thanks” to my tips (the 2nd last comment from the bottom), but you cannot see my comment, can you? That’s because I have been banned from the page. I took this screenshot from my Dad’s account actually; in my own account, I don’t even see the comment box at the bottom. Those of you who read my review of IndiBlogger would know that IndiCops also misunderstood initially, and removed my post from their forum, but when I wrote to Renie, he cleared it up within minutes and re-activated my thread. But WeBlog! Haahh! They even blocked me from their personal account “Web Logger”, so that I couldn’t send them a message directly! And then they say that they “Socialize”, that they “Care”! Now, if it had been a mistake on their part, they would have most certainly tried to get back in touch with me ASAP, by sending me a direct message or by commenting on this post! But no! They went ahead and banned Dad’s account too, just like I’d expected! 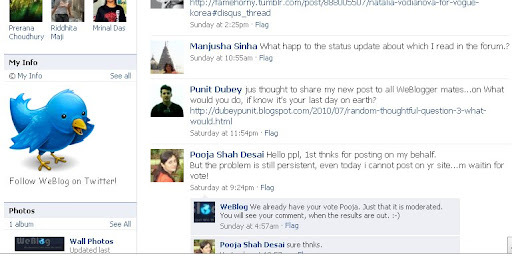 Here, see this third screen shot… Dad’s post should have come after Punit Dubey’s post, but it’s not there! And they say that they “Socialize”, they “Care”??? Maybe the meaning of these words has changed since I last checked a dictionary (which was just a few minutes ago, by the way)! I really don’t know. Anyways, I honestly have no clue why they’ve singled ME out of all the 700+ odd people! And it’s not even just the above mentioned incident, but it’s like they’ve been following my page on FB right from the day I created it! When I created the FB page for Kadzilla’s Lounge, I disabled link-posting by non-admins to avoid spam. Their page had allowed it originally, but the very next day when I visited it, I found it disabled there too! Could have been a coincidence, no doubt. And then I made this post on our FB page that everybody could start sending in their contributions for the next issue. Haah! And they immediately came up with their “Featured Post” adaptation of it! So many coincidences! Amazing! In fact, our minds seem to work so alike, I’m actually beginning to wonder if somebody made a clone of me when I was born… or if I lost a twin-sibling in the Kumbh Mela! Naah! My Dad just denied both the possibilities. So then, what do I do now? I still have 4 other accounts on FaceBook that are not yet banned by them. [Gives an evil grin… and a wink to go with it!] But frankly, I don’t have time, and besides, I couldn’t care less about what they do. This post had to be published because bloggers had to be made aware of the difference between good linkbacks and bad linkbacks. If WeBlog is so insecure about their own capabilities and skills, that they have to resort to “eliminating” deemed competition (??? ), then I wonder how long they will last anyway! In fact, the most amazing thing in the entire episode is that they feel insecure of Kadzilla’s Lounge! Haah! Insecure of a student’s project in web design! Wow! I guess I should feel honored, right? Well, perhaps I would have been, if they’d simply left a “nice work there” on the Lounge’s page, instead of banning me! Upasana! Seriously yaar! I'm actually unable to decide whether to be amused or angry! Oh god! cant believe they actually banned your account?!! that's so sick.. I had doubts about them from the beginning that they were playing some tricks.. they tried adding everyone for no reason saying we will start a website.. What I dont understand is people give interviews to some random people to make their blog popular. I never even commented on their site for the same reason. Thanks for making us aware Kaddu!! @Avada: Yeah seriously! And people with Page Rank 3 and even 4 are linking back to them, when both Web Logger as well as WeBlog are completely new entrants in the blogosphere. Nobody has ever heard of either of them before! Rather than giving anything of benefit to the people blogrolled with them, WeBlog is instead basking in borrowed sunshine from 700+ "followers"! In fact, make that "taken by force" instead of "borrowed"! I read about this but did not register. Oh! Why was that, Mr. Chowla? Did you also not feel comfortable with their over aggressive promotion? Or just didn't feel like? ya i saw the furious marketing of weblog and even I resgistered ... but didnt knw so much went behind the scenes... that was eye opening. WeBlog guys actually left a comment today on my review post in Kadzilla's Lounge. Like I would give them any outbound link till they have that linkfarm up there! And what a sneaky methodolgy they have... rather than mailing to me, apologizing for the unjustified BAN, they have the nerve to still stalk my magazine! Amazing people! I was their friends and became a fan of their page but never registered nor bothered. I just deleted after reading your and Neha's post :P.
@ Harini: Oh I had no idea they copy-pasted the interview questions from blogadda! I got to know abt it from Neha's post! And another blogger friend told me about how they were writing 5-star reviews and testimonials about their own site! Found out who WebLogger really is. Turns out it's a blogger who's also infamous for spamming people and begging for votes during contests in Indiblogger. His name is Sourav Pandey. We should now persecute this guy.